672 pages | 88 B/W Illus. Supply Market Intelligence: A Managerial Handbook for Building Sourcing Strategies charts the course to success for executives who are seeking to lead their organizations to supply-chain maturity. This volume is intended for supply-chain executives who struggle with the challenges of an uncertain supply market environment and whose supply chain function is constantly buffeted by unexpected changes in customer requirements and commodity prices. The author offers a more effective path, describing an integrated approach to supply chain management based upon solid market intelligence. This path is derived from the authors' multiple engagements with organizations such as Suncor Energy, Bank of America, Shell Oil, Honda of America, General Motors, Boston Scientific, Visteon, Federal Express, Sonoco, Duke Energy, Caterpillar, John Deere, GlaxoSmithKline, and many others. He emphasizes that the elements of a successful plan do not arise from a simple vision, instead they require much hard work and a focused approach backed by solid leadership. This book begins by defining supply market intelligence and discussing opportunities, the establishment of a project team, and conducting an internal business intelligence assessment. The book then examines the development of business and market intelligence, supplier evaluations, and sourcing strategies. 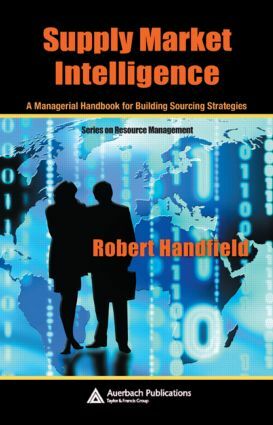 It also explores how to execute a sourcing strategy, manage a strategic supplier relationship, and redesign an organization for effective supply-chain intelligence and strategic sourcing. This volume offers a benchmarking maturity model tool that covers all facets of end-to-end supply-chain management. What Is Supply Market Intelligence? How Mature Is Your Supply Management Function? What Type of Relationship Is Appropriate for the Commodity? What is the Right Approach to a Negotiation? Relationships? What Does It Mean to Trust? What Is the Required Organizational Structure for SCM? How Will Organizations Progress through This Framework? Low-Cost-Country Sourcing: What about China?